What can be better than a trip where you can experience grandness of royal eras as well as bask in the soothing calmness of nature? A Mysore Ooty tour is one such a holiday, offering a beautiful combination of scenic beauty, majestic monuments, historical glimpses and untouched nature, all during a single trip. We at Holidays DNA, presents our customers with a holiday plan that suits everyone. Our Mysore Ooty Tour Packages offer an easy and hassle free way to explore both the tourist destinations, without facing the problems of booking and planning. At mysoretourism.travel, a part of Holidays DNA, we have designed a wide array of tour packages covering Ooty and Mysore. We have Mysore tour packages from all the major cities of the country such as Bangalore, Pune, Hyderabad, Chennai, etc as well as tour packages from Mysore to other destinations such as Ooty, Coorg, Kodaikanal, Hyderabad, etc. For travellers who are looking for a longer holiday or covering two three nearby destination in a single trip, we have many packages for them as well; one such as our Mysore Ooty tour package. Our travel experts have carefully created varied tour packages so as to cater to all kinds of holiday requirements. We strive towards creating amiable travel experience for our customers, offering them personalized attention and customising packages to suit them perfectly. From honeymoon to last minute travel, from family trip to college holiday, we ensure that everyone gets a satisfying holiday. Mysore is undoubtedly the cultural capital of Karnataka state. Its grand palaces, museums, temples and churches promise a richly experience to tourists while at the same time scenic beauty of lakes and hills presents a rejuvenating break. Once the royal city, Mysore, still glitter with the grandeur of past. There are many sightseeing places in Mysore; a few of these are listed below. Mysore Palace- Most popular place in Mysore, Mysore maharaja Palace is one of the biggest palaces in the country. The current palace was built in 1912 by a British architect Henry Irwin. Before this the same site had old Mysore palace. The architecture of the palace is worth noticing. Chamundi Hills and Chamundeshwari temple- Dedicated to Goddess Chamundeshwari, Chamundeshwari temple is one of the most important religious shrines of Mysore, attracting devotees from all over the country. It is located on Chamudi Hills, at a height of 3,489 feet above sea level. Goddess Chamundi is the deity of Mysore Royal family as well. Mysore Zoo-Mysore Zoo is another popular place in Mysore which is visited by almost every tourist. It is considered as one of the oldest and biggest zoos in the country. The zoo captivates everyone with its lush greenery and wide variety of fauna. It is especially known for its avian fauna. 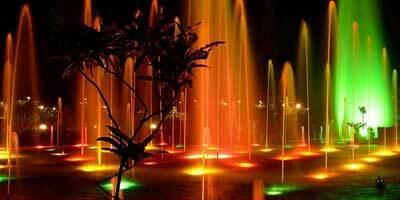 Brindavan Gardens- A trip to Mysore is incomplete without a visit to Brindavan gardens. Among the best of terrace gardens in the world, Brindavan gardens mesmerises tourists with its scenic beauty. Lush green landscapes, wide array of flowering plants, botanical park, illuminated fountains and the facility boating makes Brindavan gardens a must visit. Buddhist Golden Temple, Bylakuppe- Located about 90 km from Mysore, Bylakuppe is the second largest Tibetan settlement outside Tibet. Also known as Tibetan Golden temple and Namdroling Monastery, this monastery is one of the most beautiful architecture here. The calmness of surroundings and scenic beauty of the place captivates everyone. Rightly called as the Queen of Hill stations, Ooty mesmerises tourists with refreshing scenic beauty and lush green surroundings. Situated at an altitude of 2268 m in the Nilgiri District of Tamil Nadu, Ooty is bestowed with rich flora and fauna. The hill station boasts of rich history as well; it used to be the summer capital of madras Presidency and a holidaying destination during the colonial times. There are many popular sightseeing places in Ooty, below is a list of few places that you must visit. Doddabetta A must visit for nature lovers it is the highest peak in the Nilgiris. It is especially known for the enthralling overview of Ooty that one can get from its top. If you are looking for adventure experience, you can trek to the top of Doddabetta. There is a telescope house as well, offering a better view of the surrounding area. Avalanche Lake Located about 28 km from Ooty in Nilgiris, Avalanche Lake is a place not to be missed while on Ooty tour. A perfect blend of adventure and relaxation, this lake is one of the most beautiful lakes of Ooty. Tourists can be seen fishing here; if interested one can also spend night in tents by the side of lake. Botanical gardens- Situated at the bottom of Doddabetta Peak, Botanical Gardens were laid out in the year of 1848. Spread over an area of 22 hectares, it is maintained by the Tamil Nadu horticultural society. Ooty Lake- Spread over an area of 65 acres; Ooty Lake was created in 1824. This man-made lake was built during the British Rule. Boating at this lake is very popular. In the month of May, boat races are also conducted which are a huge hit among tourists and local residents. Ooty Mountain Railway- Built in 1908, during the British rule, Ooty Mountain railway has been declared as a UNESCO world heritage site. Here, the trains are still powered with the help traditional steam engines. Both the destinations, Ooty and Mysore are well connected to all the major cities of the country. Mysore is connected via railways and roadways to the rest of the country. If travelling via flight, one needs to get down at Bangalore and then travel via train or bus/cab to Mysore. The distance between Mysore and Ooty is only 125 km, which can be covered in slightly more than 3 hours. If travelling from Bangalore, Ooty is about 270 km away and can be reached in about 6 hours, while the distance between Mysore and Bangalore is about 145 km, which can be covered in about 3 hours. There are government as well as private buses from Bangalore to Mysore and Ooty as well as from Mysore to Ooty. Tourists can also hire a cab or taxi.